How can we shrink it? 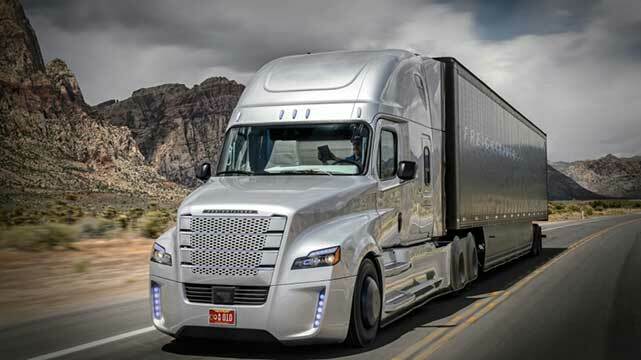 The Daimler Freightliner Inspiration Truck, the first licensed autonomous commercial truck to operate in American highways. Much of the stuff around us at any given moment – be it product, commodity or raw material – was once on a boat. To get from wherever it was made or processed or harvested to wherever it’s used or consumed, all this stuff embarks on a seaborne journey around the world. It happens thousands of times a day, on tens of thousands of vessels moving from port to port. 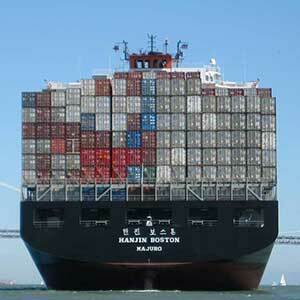 Ships handle roughly 90 per cent of global trade, nearly 10 billion metric tons (11 billion tons) of stuff per year. Boats and ports are only a part of the picture. Airlines, railroads, trucks, warehouses, refrigerators, delivery people – the international system of goods movement is integral to the way we live in the 21st century. It also is a huge source of opportunity to reduce humans’ environmental footprint. It’s been estimated that shipping accounts for three to four per cent of human-caused carbon emissions. More than 47,000 big ships handle the bulk of this cargo, most of which (by weight) is made up of crude oil, iron ore, coal and other building blocks of the modern world. About 6,100 container ships carry the consumer goods we’re more likely to encounter and purchase – the televisions and socks and frying pans of day-to-day life. Transported around the world in standardized containers, it is this stuff that has dramatically transformed shipping from a dockside hustle of men hauling crates to a highly mechanized, multimodal system that can have a box of South American bananas off a boat and on sale in the U.S. within hours. A Hanjin container ship travelling through San Francisco Bay. The environmental cost of moving those bananas is, of course, complex. Big ships can use more than 100 metric tons (110 tons) of fuel oil per day and can take two weeks or more to traverse oceans. Shipping’s international nature makes it tricky to control; measures such as fuel regulations and emissions standards have long implementation periods and are slow to achieve greenhouse gas reductions and environmental goals. Standards vary inside and outside so-called “emissions control areas” established by the International Maritime Organization, a United Nations agency focused on shipping. The fuel used in ships, for instance, still contains low levels of sulfur and is highly polluting. and it’s been estimated that shipping accounts for three to four per cent of human-caused carbon emissions. A recent report from the European Parliament estimated that number could rise as high as 17 per cent by 2050. In spite of this potential, shipping hasn’t been prioritized in any of the international agreements coordinated through the U.N. Framework Convention on Climate Change, and the latest agreement coming out of the COP 21 talks in Paris does not include stipulations on shipping or the high emissions caused by air freight. Even so, there’s a reason all this stuff travels by boat. Aside from being the cheapest mode, it’s also the most carbon-efficient method of shipping: A big ship will emit about 10 grams (0.4 ounces) of carbon dioxide to transport 1 metric ton of cargo 1 kilometer (2 tons of cargo 1 mile). That’s roughly half as much as a train, one-fifth as much as a truck and nearly a fiftieth of what an airplane would emit to accomplish the same task. “If ships were to move to cleaner diesel fuels, that would be a big reduction in emissions,” says Genevieve Giuliano, director of the METRANS Transportation Center at the University of Southern California. All of the major shipping lines are looking into new fuels and other sustainability measures. Earlier this year, Harvey Gulf International Marine became the first North American company to add liquefied natural gas, which produces less CO2than conventional marine fuels, as a fuel for an offshore support vessel. And the first two cargo ships are set to begin using LNG for hauling cargo. Others are expected to follow, but transitioning ship engines on a wide scale will take time. For instance, newer ships have been designed to carry more without a proportional increase in fuel use. The biggest ship today is capable of transporting close to 20,000 of the type of containers typically carried by a semi-trailer on the highway, a huge jump from the roughly 2,500 that the first purpose-built containerized ships could carry in the 1970s. And, as this capacity has grown, ports have adapted to handle the influx. “Ports are getting more and more automated and even robotized,” says Rodrigue. Ships can essentially plug into the ports where they dock, tapping into local power instead of idling their huge engines and burning hundreds of tons of fuel to sit still. Automated cranes can quickly unload and reload ships to reduce their time in port. And the same systems can quickly move those thousands of containers onto the trucks and trains that carry them off across the land. The era of huge container ships has led to the development of logistics hubs, with rail yards, truck bays and massive warehouses that receive, sort and redistribute all these goods. Transporting freight on rail is more energy efficient than transporting it by truck, says Asaf Ashar, an emeritus research professor with the University of New Orleans’ National Ports & Waterways Initiative. But while it makes sense energy-wise to transport freight on rail for most mid- and long-range hauls in the U.S., for example, the flexibility of trucking and the wide geographic spread of the country means that most stuff is eventually moved to its point of sale or use by truck. According to the American Trucking Associations, trucks carry about 70 per cent of the tonnage of stuff moving throughout the U.S. annually, requiring 3 million trucks and more than 37 billion gallons (140 billion litres) of diesel fuel. 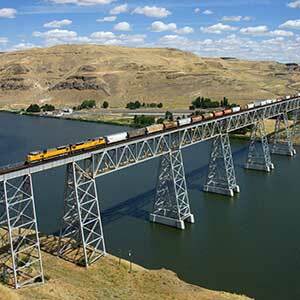 A long grain train of the Union Pacific Railroad crossing a bridge in Washington State. Automation is seen by many as the biggest change coming to the system of goods movement, and it is already being implemented in a wide variety of ways. From the automated cranes moving containers from ships to trains and trucks to algorithms that schedule and route deliveries, automation is already having an impact on the overall efficiency of the goods-movement system, cutting both costs and energy demands. Port automation has also been found to dramatically improve the use of land within port complexes, thereby prolonging or even eliminating the need to engage in environmentally costly expansion projects. And many expect the energy savings and efficiency gains of automated systems to play a much bigger role in reducing the overall environmental impact of the global goods movement system. “Not anything within a year or two, but within a decade or so we could see very interesting stuff,” says Rodrigue. “A lot of vehicles will be self-driving, dropping stuff automatically at some specific, pre-set points, and the loading and unloading will be somehow automated, and people will just need to pick up their stuff.” The reduced energy costs of automated vehicles and optimized routing and deliveries could mean we’ll need fewer energy-sucking vehicles on the road to get all the stuff we need. The question of how people ultimately get all this stuff is another dominant conversation in the goods-movement world. With the rapid growth of e-commerce and delivery options from retailers such as Amazon that promise packages within day or hours, moving all these individual packages from seller to buyer has created new challenges, particularly in terms of carbon emissions from delivery vehicles. Ideas for addressing the congestion and energy requirements of the so-called “last-mile” issue range from centralized delivery boxes to cargo bicycles. Big companies like FedEx are investing in hybrid or all-electric delivery vehicles. 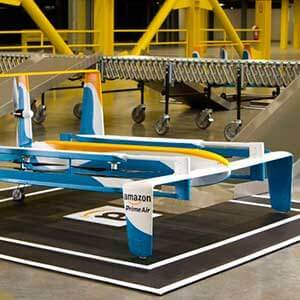 Amazon is famously investigating the potential of delivery by battery-powered drones, which could reduce their reliance on traditional vehicles and their emissions. 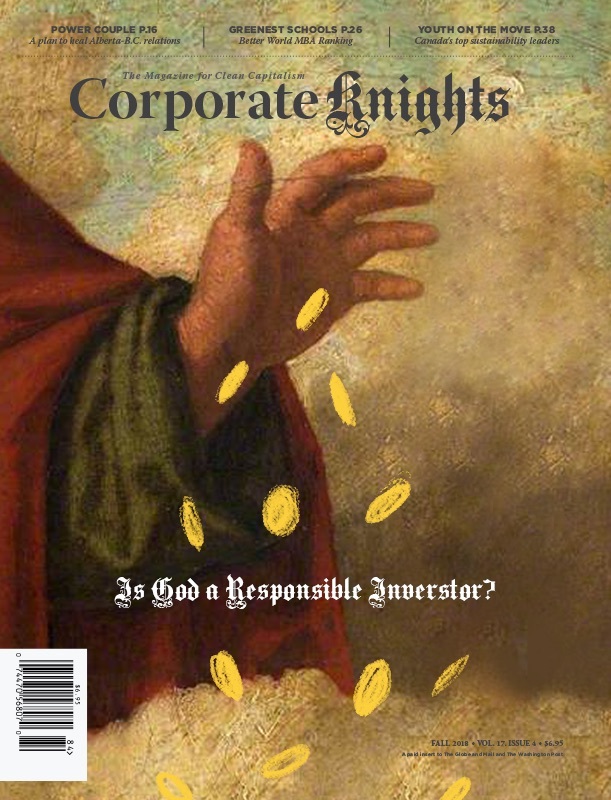 But many experts say the idea is just speculation at this point. With the rise of 3-D printing, some technologists are looking at the potential of distributed manufacturing – factories interspersed throughout urban areas where machines can print whatever part or product a consumer could want or need, eliminating the need to ship a part across an ocean, or put it in a box in the back of a delivery truck. Efficiency gains and developments in automation may have the biggest influence on how the environmental footprint of our global system of goods movement evolves in the coming years. And even if self-driving trucks and delivery drones eventually revolutionize the movement of stuff over land, almost all of that stuff will still start its long journey on a boat.